The 2015 draft Medicare Physician Fee Schedule rules propose doubling the penalties/rewards under Value Based Purchasing (VBP). AND the timeframe for submitting your comments on the 2015 Draft Medicare Physician Fee Schedule is quickly drawing to a close (9/2/2014). The season for commenting on the 2015 Draft Medicare Physician Fee Schedule is quickly drawing to a close (9/2/2014). For anyone interested in making a comment, but struggling with finding the words to describe problems with Value Based Purchasing, I’m filling today’s blog with our comments. This is the 3rd post in a row that discusses aspects of the Fee Schedule and VBP – apologies to any (remaining) readers who don’t really care about how Physicians and Nurse Practitioners get paid. However, when the #1 source of reimbursement (Medicare) is making a proposal to cut your pay by 2% to 6% based on erroneous assumptions, I get involved. So below you will find our (slightly edited) comments that we submitted to CMS – if you don’t have anything better to do over the Labor Day weekend please send your own into CMS. 1. The 2015 draft Medicare Physician Fee Schedule rules propose doubling the penalties/rewards under VBP. For CY 2015 (affecting CY 2017 payments), CMS proposes moving from ±2.0x% payment adjustment to a ± 4.0x% adjustment range. The mysterious ‘x’ factor may attenuate the final adjustment, but is irrelevant to this discussion. The following table illustrates the proposal. The draft rule makes no mention of the concerns expressed by Medical Groups, other than Hospitalists, that serve a systematically high cost Medicare Population. The deadline for submitting comments on the 2014 draft Fee Schedule precluded inclusion of any analysis of 2012 Quality and Resource Utilization Reports (QRUR) so our comments were general, and speculative, in nature. That has changed. 2012 QRUR Reports Show Systematically High Costs for PA/LTC Medical Groups These comments are submitted specifically addressing problems with the VM for Medical Groups that work exclusively in the PA/LTC setting (nursing facilities – but also including Assisted living, and Home Based care). Once the 2012 QRUR reports were distributed, four large (over 25 eligible professionals) PA/LTC medical groups began comparing results. These groups had different ownership and came from three different markets. The groups volunteered to share data and allow anonymous publication of certain data elements. This information was submitted to our professional society (AMDA) and shared with staff of the CMS Office of Clinical Standards and Quality, plus representatives of other CMS departments. Based on the QRUR reports of these four large groups and anecdotal reports from other very large LTC groups, the Value Modifier Cost calculation always placed the groups in the “high cost’ category. This was consistent; the four groups sharing data placing in either the 96th or 97th percentile of the Cost Composite Score. If the Cost Composite Score was calculated using a valid risk adjustment measure, it is highly unlikely that four uncoordinated medical groups would each fall approximately 2 standard deviations above the mean. The chances of this happening in a random distribution are below 1/10th of one percent. This indicates it is highly unlikely that the Risk adjustment methodology being employed by CMS for the VBP Cost Composite Score is correct. 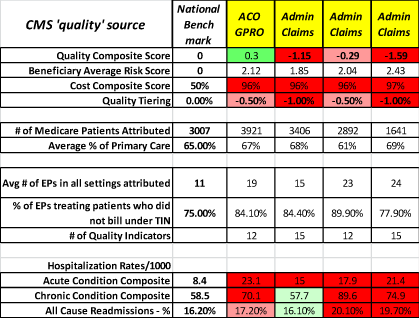 We believe it is impossible to avoid this High Cost Composite Score under the current model if a Medical Group acquires (via attribution) patients first treated during a Part A episode of care. In the Nursing Home environment, virtually 100% of new admissions have an Acute Care Episode preceding a SNF stay. Obviously, each of these patients is also experiencing a SNF episode with its associated costs. In VBP the PA/LTC Medical Groups’ costs are compared to a benchmark of Ambulatory Practices – where many patients with the same ‘acuity’ are not hospitalized, or subsequently sent to PA/LTC care. There is no acuity adjustment to compensate for the significant Part A episode costs associated with the PA/LTC patient population. We are urging CMS to revisit this issue and make a thoughtful correction to the problem we identify. We are mindful of the need to propose a solution to the preceived problem. Many of the large PA/LTC Medical groups and AMDA committees have explored possible solutions. My group is recommending that CMS adopt a cost analysis model that is based upon the patient population being served by a Medical Group. 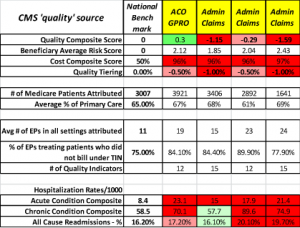 Physicians and NPs who treat the most costly Medicare patients should not be adversely affected by the flawed Cost Composite Score Methodology. We are proposing CMS adopt a refined methodology that effectively identifies the most costly patients (e.g. those who receive significant amounts of care in the Post-Acute Care setting). The only semi-impartial way to construct a cost measure that is neutral to Medical groups, particularly hospitalist and PA/LTC physicians, is to calculate expected cost per patient based on the Place(s) of Service that is associated with the majority of ‘attributable encounters’. This is a concept we presented to CMS in the spring of 2014. Staff acknowledged that the Cost data from the QRUR reports of the four PA/LTC medical groups warranted further study. Possibly due to personnel changes at CMS, this idea didn’t carry into this year’s proposed rulemaking. This proposed model is intended to work without the need to create new (nonexistent) data elements. The model would follow the current plan through Patient Attribution via the Plurality of Encounter methodology. A NEW STEP (Alternate #1) – Once patients are ‘attributed’ to the Medical Group, the location (as in Place of Service) associated with the majority of patient’s encounters is assigned to that patient. Calculate the Expected Patient Cost based on each POS or POS Group. Once every attributed patient was associated with a POS group, they become their own sub-population. Their average cost and acuity become the new benchmark for measuring relative Medical Group performance. Using this methodology, providers would truly be measured against their peers. This would have the benefit of giving every provider a statistically valid opportunity to achieve the status of low cost. Creating this ‘level playing field’ is a key element of CMS’ cost containment objectives. There is more opportunity to improve cost performance among patients whose average actual costs exceed $30,000 than in those who only consume a few thousand dollars. We hope these comments reflect our underlying support for the principals of Value Based Purchasing while identifying correctable flaws in the methodology.